Just when we thought rappers and their grills couldn’t get any more irritating, it turns out we were dead wrong. Grills, the flashy tooth jewelry that seems to mark the socioeconomic standing of those in the rap music community, have until now been just shiny removable display pieces. But then artist Aisen Chacin put an MP3 player into one and called it a Play-A-Grill. Because the grill sits on top of the teeth, the MP3 player conducts sound through the teeth. That means you can listen to music without headphones because the beats are delivered through your own body. 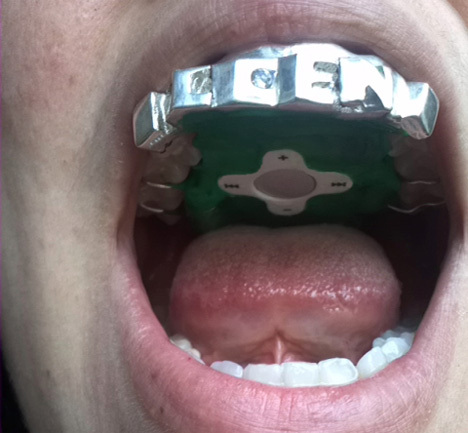 The controls fit on the roof of the mouth in a hard retainer-like object. Once you learn the location of the buttons you can control the player with your tongue. The weird but inventive project kind of makes you wonder what other music interfaces are out there that we just haven’t explored yet.